Judge John Deed is on a mission for justice - and he's prepared to break the rules to deliver it. In his red robes and wig Judge John Deed might look like every other High Court judge, but his passionate belief in justice sets him apart from his peers. 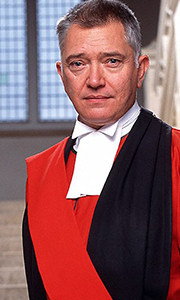 To the police force, the Crown Prosecution Service, the Lord Chancellor's Department and even many of his colleagues, Deed is a man more concerned with justice than the letter of the law ..
Judge John Deed has made it to the top of his profession on his own terms. Fearless and independent, he regularly crosses establishment figures - men like his former father-in-law, Lord Justice of Appeal Channing; his ex-wife's fiancee the Home Secretary; or Sir Ian Rochester at the Lord Chancellor's Office - who try to influence his decisions. A sharp intellect, a rakish charm and keen wit help Deed stand his ground but, along with his..
Also starring Jenny Seagrove, Louisa Clein, Donald Sinden, Barbara Thorn, Simon Chandler and Simon Ward. Hard-Gating: A young black man is stabbed to death in a shared cell - by a known racist - a week before he is due for release. Over-crowding is the Prison Service’s excuse, but the Judge’s questioning reveals that this prison wasn’t up to capacity. My Daughter, Right or Wrong: A fire-bomb in the animal “hotel” of the science faculty ..
Judge John Deed: Two nail biting episode stories from the longest running BBc legal drama find the uncompromising Judge called to the International Criminal Court in the Hague and taking on a controversial case at home. War Crime: Deed is in The Hague hearing a case of a young British soldier who killed eleven Iraqi civilians and is now accused of war crimes. At home, a ruling on the case of a BNP councillor has brought Deed's name to ..